In recent years there has been a renewed interest in the settlements awarded by the federal government to the Métis inhabitants of Manitoba and the former North-West Territories. The records created by the scrip commissions, and the Department of the Interior in its administration of federal land policies, are now consulted by a wide range of users. The records have become particularly important, however, in two key areas: in the debate surrounding Métis allegations into the mishandling of their rights, as an Aboriginal people, by the federal government; and in family histories, especially with those seeking re-instatement under the Indian Act. As an archivist I find it very encouraging to see the attention accorded to these records, but I must also admit to some feelings of apprehension for anyone about to undertake research into Métis scrip. Regrettably, the records documenting scrip settlements by the various Commissions are not well organized - a problem the National Archives of Canada inherited when the records were transferred into its custody in the 1950s, 1960s, and 1970s. There was little consistency in the records keeping practices of one Commission to the next, and when this medley was coupled with inadequate records management within the Department of the Interior, the resulting legacy can be very confusing for first-time researchers. As a case in point, it is not uncommon for researchers to assume that a scrip application for a particular individual should be found in one of the four series labeled "scrip applications" in the records of the Department of the Interior - namely, RG 15, series D II 8a, affidavits, 1870-1885; series D II 8 b, applications, 1885; series D II 8c, applications, 1886-1906; and series D II 8d, applications, Mackenzie River District. Admittedly, this is not an unreasonable assumption, but the truth of the matter is quite different. Numerous scrip applications can also be found in the three correspondence registries established by the Dominion Lands Branch - and which are now retained by the National Archives of Canada as: Correspondence Headquarters, series RG 15 D II 1; Manitoba Act Files, series RG 15, D II 2; and Half-Breed Files, series RG 15 D II 3. Apparently, it was a common practice for departmental employees to remove applications from the four special applications series and place them in case files in one of the correspondence registries. Such practices usually occurred whenever a claim required special consideration. The case file would then retain all departmental records pertaining to the claim, including the application itself. Part of the problem with scrip records no doubt originates with the lack of information available on the records. Most scrip research, to date, has focused on government policy; almost nothing has been said about Departmental administrative practices - that is, the day-to-day processes by which the department created and used scrip records. Of course without this context, researchers find it very difficult to assess where they should go to find the documents they require; and once the documents are found, how they should be interpreted and used. The following guide was compiled to assist researchers who wish to consult federal records relating to the Métis scrip commissions. The guide is not meant to be exhaustive or definitive; rather it is intended to direct researchers to the obvious archival sources retained by the National Archives of Canada in Record Group 15 (RG 15), the records of the Department of the Interior. As the primary agency responsible for the administration and development of all federal lands and natural resources in the former North-West Territories, the Department of the Interior played a significant role in the formation of federal scrip policy; in the creation and management of the scrip commissions; and in the administration of each commission's decisions concerning the awards given to individual Métis families. Given its mandate, it is only natural then that the majority of scrip commission records held by the National Archives should be found in the record group established for the Department of the Interior (RG 15). It is hoped that this guide will help researchers to become more knowledgeable in RG 15 scrip records and will provide them with the necessary background to explore, on their own initiative, other holdings of the National Archives. For example, the Manuscript Division of the National Archives retains the private papers of several prime ministers and cabinet ministers who exercised considerable influence over federal policy on Métis issues. Most notable among these other sources are the papers of Sir John A. Macdonald (MG 26A), Prime Minister of Canada, 1867-1873 and 1878-1891, Minister of the Interior, 1878-1883, and Superintendent General of Indian Affairs, 1878-1887; Alexander Mackenzie (MG 29A), Prime Minister of Canada, 1873-1878; David Laird (MG 27 I D10), Minister of the Interior and Superintendent General of Indian Affairs, 1873-1876, Lieutenant-Governor of the North-West Territories, 1876-1881, and Indian Commissioner for the North-West Territories, Manitoba, and Keewatin, 1898. Since the awarding of scrip was one of the federal government's chief methods of extinguishing aboriginal title, the question of whether or not an individual or his/her ancestors took scrip could be a critical aspect in determining Indian status. Consequently, the records of the Department of Indian Affairs (RG 10) contain a number of files, primarily in the "Black Series" (RG 10, series B 3b), which relate to individual cases of scrip taking and its impact on their treaty rights; which document the re-entry of individuals into treaty who had previously taken scrip; and which record the general development of federal scrip policy after the demise of the Department of the Interior in 1936. Also, RG 10, series B 8m, contains some nominal indexes of applications to leave treaty and take scrip (1870-1920); lists of Métis who withdrew from treaty (1885-1926); lists of Métis who received scrip and later re-entered treaty (1885-1910); and records relating to scrip payments and other accounts (1884-1903). Researchers interested in studying government policy on Métis scrip should obviously consult the inventories and finding aids to this source as well. As previously pointed out, this database primarily focuses on the records created by the Department of the Interior in support of the various commissions authorized to enumerate Métis residents in western Canada. This enumeration process was undertaken by the federal government for the purpose of extinguishing any land rights the Métis may have had as a result of their aboriginal status. There are some other records contained in RG 15, which document the scrip taking process, but which do not related to a specific commission, and consequently, have not been included. In some cases, these other records will document a much broader range of scrip awards than that issued to the Métis. For example, RG 15, series B 3 (volumes 1754 to 1760) contains scrip ledgers and registers created by the Accounts Branch, Department of the Interior. These records helped the department's accountants to keep track of the issue and redemption of all forms of scrip, including that which was awarded to Métis residents and that which was awarded to military personnel serving in the 1885 rebellion and the Boer war. The ledgers are useful in documenting the persons (the buyers and assignees) who redeemed such scrip. As well, RG 15, series D II 8 l (volumes 1424 to 1474) contains a series of land assignments. 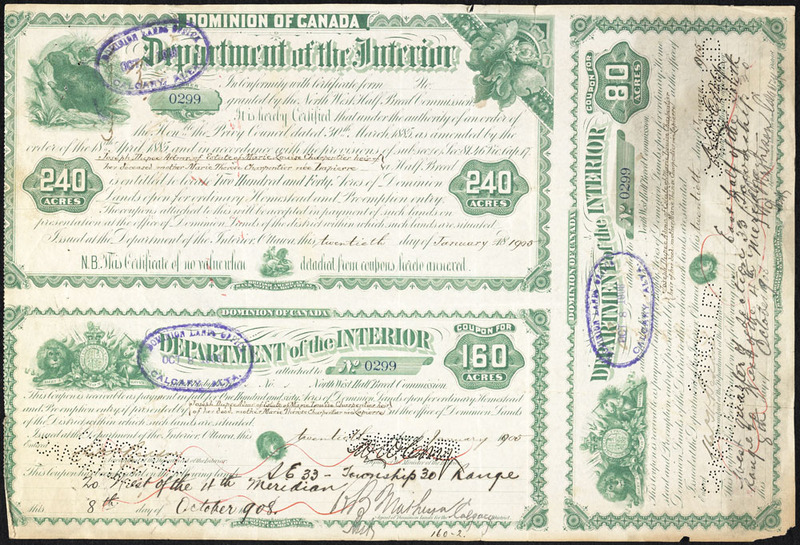 These documents were used to transfer property rights (by the assignor) to a second party (the assignee) prior to filing a homestead fiat and were used in all situations involving Dominion Lands, including those acquired through the use of Métis scrip. Yet another series, RG 15, III 14, contains several reports issued by Judge Robert H. Myers who was appointed by Order-in-Council, P.C. 1148, 21 June, 1905, to investigate complaints of misrepresentation against R.C. Macdonald by Métis residents in the United States. And finally, the federal government's handling of Métis scrip - among other things - was a subject of in-depth analysis by the three royal commissions which were established to investigate the transfer of natural resources administration from the Crown to the three prairie provinces. The records generated by the Department of the Interior in support of the federal position can be found in RG 15, series A 2k, A 2l, and A 3, while the records created by the Commissions themselves can be found in RG 33. The records for Saskatchewan are located in RG 33-50, for Alberta in RG 33-51, and for Manitoba in RG 33-52. Obviously, any researcher who is interested in studying the scrip process in detail should have a closer look at the series descriptions for these records in the RG 15 and the RG 33 inventories. A number of my colleagues at the National Archives of Canada put an incredible amount of time and energy into assisting with the preparation of this guide; others undertook various custodial projects to help make the records it describes more accessible to researchers. Maggie MacLelland and Nancy Cound digitized several of the older, paper-based, finding aids (FA15-16, FA15-17, FA15-19, FA15-20, FA15-21 and FA15-22); Yvan Goudreau assisted with the proof-reading; and Freda Thompson and Patti Anderson converted the digital files into a MINISIS format. Bennett McCardle and Bill Russell graciously read the draft manuscript and made suggestions for its improvement; Antonio Lechasseur, Martin Tétreault, Jean-Stéphan Piché, Normand Fortier, and Denis Boulé edited the French translation; Doug Payette, Art George, and Ross MacKay supervised various aspects of the contract awarded for the microfilming of the Dominion Lands Branch central registry series (RG 15, D II 1); and Simon Snow, Yvan Goudreau, John Armstrong, and Carl Bouchard undertook the work required to upgrade the RG 15 and RG 68 entries in the MINISIS specialty database for the Land Patents. Special notes of thanks are extended to Bruce Wilson for his unfailing support throughout the tenure of this project, and to Doug Whyte who cheerfully put up with an office crammed full of dusty registers and a ranting officemate. Use of the Term "Half-Breed"
Essay: Métis Scrip - "The Foundation for a New Beginning"